Working principle of the DC-TENG. (A) (i) Phenomenon of the triboelectrification effect and electrostatic breakdown (lightning) in nature. (ii) Working mechanism of a conventional TENG. (B) A schematic illustration of the sliding mode DC-TENG. (C) Working mechanism of the sliding mode DC-TENG in full cyclic motion. (D) Equivalent circuit model of the DC-TENG. (E) Constant current output of the DC-TENG. Credit: Science Advances, doi: 10.1126/sciadv.aav6437. Scientists have dedicated intense work in recent years to convert environmental energy into electricity to meet the ongoing demands for a cleaner and more sustainable power source. Harvesting environmental mechanical energy as an eco-friendly method is a promising solution and plays a significant role in building wearable electronics and sensor networks in the Internet of Things (IoTs). A triboelectric nanogenerator (TENG) is a self-powered, feasible solution to convert mechanical energy into electricity and specifically satisfy the increasing demand of the internet of things (IoTs). 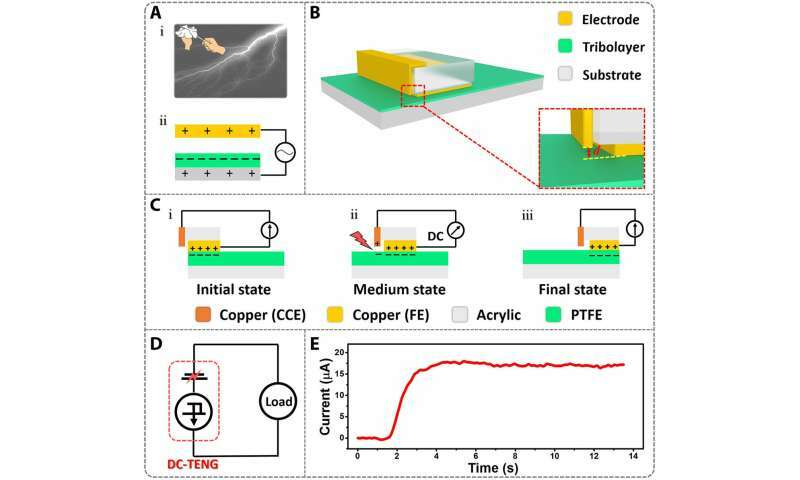 In the present work, Di Liu and co-workers at the Departments of Nanoenergy and Nanosystems, Materials Science and Engineering, and Nanoscience and Technology in China and the USA, developed a next-generation TENG to realize constant current output by coupling the triboelectrification effect and electrostatic breakdown. 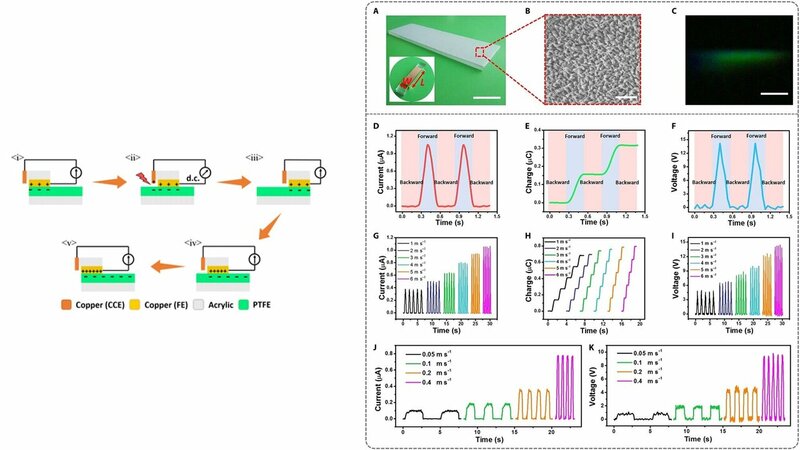 They obtained a triboelectric charge density (430 µC m-2), much higher than those with conventional TENG—that were limited by electrostatic breakdown. The findings of the study are now published in Science Advances, to promote the miniaturization of self-powered systems for use in IoTs and provide a paradigm shift technique to harvest mechanical energy. Lightweight and wearable power supply modules with high energy storage performance are desirable for wearable technology in materials science. They can be conventionally achieved by directly integrating a rechargeable energy storage device, i.e. a battery or supercapacitor into fabrics. Mechanical energy harvesting has attracted much attention as explored through the techniques of electromagnetic generators (EMGs), piezoelectric nanogenerators (PENGs) and triboelectric nanogenerators (TENGs). LEFT: Working principle of the sliding mode DC-TENG during the first cycle. Copper electrodes are in orange (CCE) and yellow (FE), PTFE is green, and acrylic is white. RIGHT: Output performance of the sliding mode DC-TENG. (A) Photographs of the stator and the slider (inset) of the sliding mode DC-TENG (W is the width of the FE and L is the length of CCE; scale bar, 3 cm). (B) Scanning electron microscopy (SEM) image of nanowires on the surface of PTFE. Scale bar, 1 μm. A larger surface curvature results in an ultrahigh electric field, which is easier to air breakdown. (C) Phenomenon of air discharge in this paper. Scale bar, 1 cm. (D) Short-circuit current, (E) transferred charges, and (F) open-circuit voltage of the sliding mode DC-TENG. (G) Short-circuit current, (H) transferred charges, and (I) open-circuit voltage of the sliding mode DC-TENG at different accelerations. (J) Short-circuit current and (K) open-circuit voltage of the sliding mode DC-TENG at different velocities. Credit: Science Advances, doi: 10.1126/sciadv.aav6437. While EMGs are based on Faraday's law of electromagnetic induction, suitable for large-scale power generation, PENGs can convert tiny physical deformations into electricity in self-powered, small-scale devices. 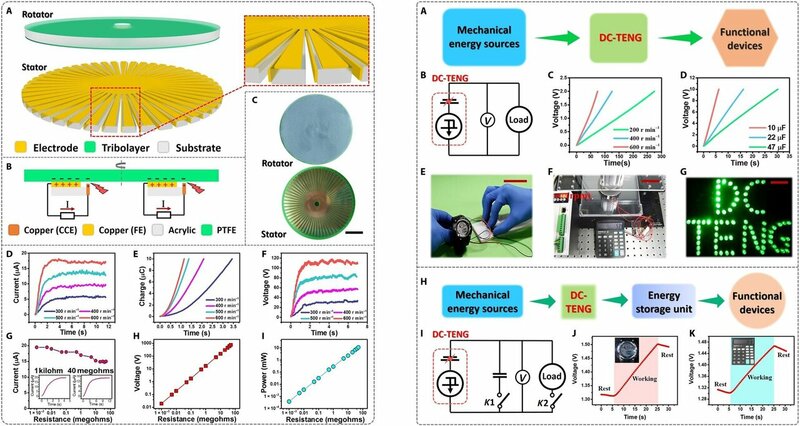 Conventional TENGs have demonstrated cost-effective, clean and sustainable features, on the basis of triboelectric effects and electrostatic induction to convert energy into electricity. The TENGs also offer lightweight, small size, a wide choice of materials and high efficiency even at low frequencies. Conventional TENGs are withheld due to the requirements of a rectifier (corrector), such as a rotary rectifier bridge to generate a DC output, which limits its portability. In addition, AC powered TENGs require electromagnetic shielding through sensor integration, which can reduce the degree of its accommodation in a miniaturized device. The pulsed output can give rise to a very high crest factor, which is a key metric to output instability influencing the performance of energy storage and electronics, where constant input is preferred. While a constant DC output was realized very recently using the sliding Schottky nanocontact technique, the output voltage was too low to directly drive electronics. In the present work, Liu et al. therefore invented DC-TENG, to address these issues and generate constant DC by directly coupling triboelectrification effect and electrostatic breakdown as a paradigm-shifting technique. The working principle of DC-TENG relied on triboelectrification or charge transfer between two surfaces in contact in ambient environments, resembling the same natural principle behind the amber effect and lightning. For this, Liu et al. 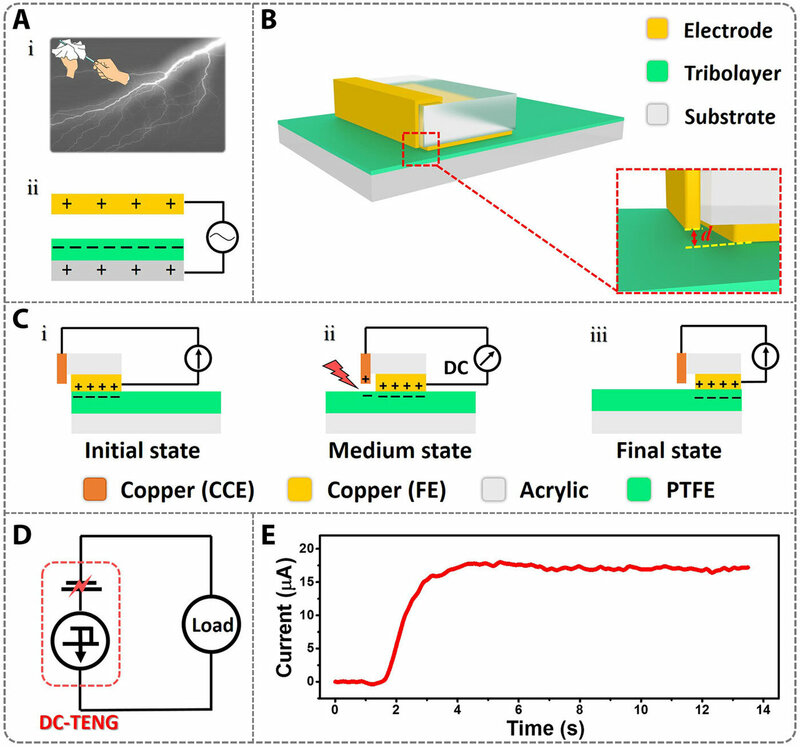 induced artificial lightning with a charge-collecting electrode (CCE), frictional electrode (FE) and triboelectric layer in the next-generation DC-TENG setup. In the experiment, the scientists used copper electrodes for both CCE and FE, and a polytetrafluoroethylene (PTFE) film attached to an acrylic sheet as the triboelectric layer. LEFT: Working mechanism and output performance of the rotary mode DC-TENG. (A) Structural design of the rotary mode DC-TENG. Inset shows a zoomed-in illustration of its stator. (B) Working mechanism of the rotary mode DC-TENG. (C) Photographs of the fabricated rotary mode DC-TENG. Scale bar, 5 cm. (D) Short-circuit current, (E) transferred charges, and (F) open-circuit voltage of the rotary mode DC-TENG at different rotation rates (300, 400, 500, and 600 r min−1). (G) Output current of the rotary mode DC-TENG with various resistances. Inset shows the detailed output current at 1 kilohm and 40 megohms. (H) Output voltage and (I) power of the rotary mode DC-TENG with various resistances. RIGHT: Application of the DC-TENG to drive electronic devices. (A) System diagram and (B) circuit diagram of a DC-TENG–based self-powered system to power electronics directly. (C) Measured voltage of a capacitor (470 μF) charged by a rotary mode DC-TENG at different rotation rates. (D) Charging curves of capacitors with various capacitance charged by a rotary mode DC-TENG at a rotating speed of 500 r min−1. (E) Photograph of a watch directly driven by a sliding mode DC-TENG. (F) Photograph of a scientific calculator directly driven by a rotary mode DC-TENG. (G) Photograph of 81 LEDs with stable luminance powered by a rotary mode DC-TENG. (H) System diagram and (I) circuit diagram of the self-powered system to power electronics with energy storage units. (J) Charging curves of the capacitor when the watch is driven by a rotary mode DC-TENG simultaneously. (K) Charging curves of the capacitor when the scientific calculator is driven by a rotary mode DC-TENG simultaneously. Scale bars, 5 cm. Photo credit for (E), (F), (G), (J), and (K): X. Yin, Chinese Academy of Sciences. Credit: Science Advances, doi: 10.1126/sciadv.aav6437. Based on the initial alignment between the electrodes and the PTFE film, Liu et al. generated a quasi-permanent electric charge on the PTFE film. They moved a slider in the medium to build a very high electrostatic field between the CCE and negatively charged PTFE film. When the electrostatic field exceeded the dielectric strength between them at an approximate value of 3 kV/mm, the nearby air became partially ionized to begin conducting. This technique resulted in the flow of electrons from the PTFE to CCE in the experiment to rationally induce air breakdown and create artificial lightning. Unlike with conventional TENGs that did not tap the energy of air breakdown, Liu et al. used the CCE to effectively collect these charges. In brief, in their experimental setup, the electrons on the FE transferred to PTFE via triboelectrification, then transported to the CCE via electrostatic breakdown and ultimately to the FE via an external circuit. When the slider returned to its initial state in the experiment, there was no current flow in the external circuit due to the absence of a potential difference across the CCE and PTFE film. In this way, the scientists produced cyclic DC by periodically moving the slider, they measured the DC resulting from the unidirectional dielectric breakdown of the capacitor to produce an ongoing conduction current. Liu et al. showed that the charge quantity harvested by the DC-TENG via dielectric breakdown was greater than that harvested by conventional TENG using electrostatic induction and aimed to use this new paradigm as a prototype to harvest lightning energy. They intend to investigate the detailed mechanism of the process and form a precise theoretical model in the future. An electronic watch is powered directly by the sliding mode DC-TENG. Credit: Science Advances, doi: 10.1126/sciadv.aav6437. In the present study, Liu et al. designed two modes of DC-TENG: a sliding mode and a rotary mode. To implement the sliding process the scientists used a linear motor and used a commercial motor to drive the rotary process. They used scanning electron microscopy (SEM) images to view the nanowire electrodes (CCE and FE) on the PTFE surface. When they moved the slide along the electrified layer, the scientists captured the phenomenon of corona discharge as a green glow during air breakdown between PTFE and CCE as solid evidence of air breakdown during device operation. They measured the surface potential of PTFE to show electrostatic charge discharge by electrostatic breakdown using an Isoprobe electrostatic voltmeter, followed by the measurement of short-circuit current and transferred charges of the DC-TENG, using a programmable electrometer. To measure the open-circuit voltage of the sliding mode DC-TENG, they used a mixed domain oscilloscope—all results exhibited characteristics of good DC output. Liu et al. showed that the initial charge density of the DC-TENG was higher (330 µC m-2) than conventional TENG (~ 70 µC m-2). To enhance the charge density, the scientists introduced nanostructures on the PTFE surfaces using inductively coupled plasma processes to modify the material and achieve a six-fold charge density enhancement at 430 µC m-2. The work showed that the output performance of the system could be enhanced by simple structural optimization of the PTFE film surface. When Liu et al. measured the long-term output current of the DC-TENG after 3000 cycles, the DC output current remained nearly stable, confirming excellent stability of the setup. In parallel, the scientists similarly measured the output performance of rotary mode DC-TENG. The structure of the setup contained a stator and a rotator, and much like the sliding mode DC-TENG the Fes and CCEs were connected. As before, the scientists conducted measurements to show how electricity generation relied on the relative rotation between the rotator and the stator for better performance compared to conventional DC-TENG. LEDs powered by the rotary mode DC-TENG. Credit: Science Advances, doi: 10.1126/sciadv.aav6437. Due to their continuous DC output generation, Liu et al. demonstrated applications of novel DC-TENGs to drive electronic devices without using a rectifier. For device functionalization, the self-powered DC-TENGs were able to drive electronics directly by converting mechanical energy. As a proof-of-principle, the scientists formed an electronic watch driven directly by a sliding mode DC-TENG and a scientific calculator driven by a rotary DC-TENG. In addition, they formed a light-emitting diode (LED) bulb array, which could be lit up by the rotary mode of DC-TENG, and unlike LED driven via conventional TENG, these LED lights remained without flickering at a constant luminescence. In this way, Liu et al. achieved the conversion of mechanical energy into constant output current by designing next-generation DC-TENGs based on the coupled effect of triboelectrification and electrostatic breakdown. 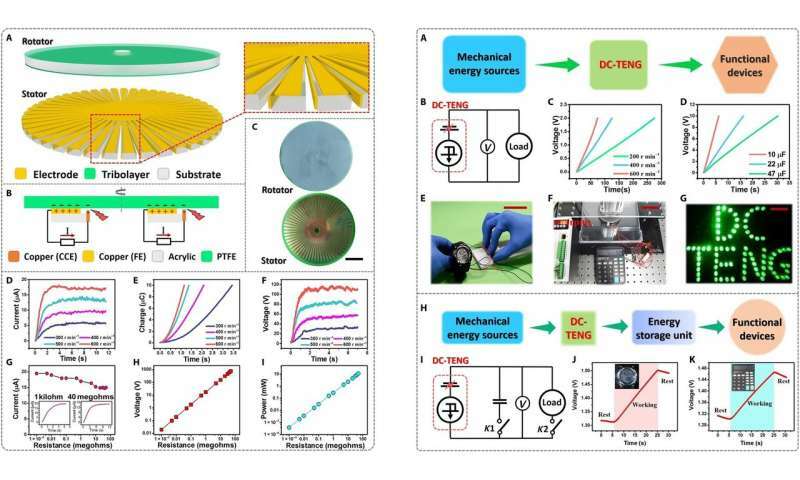 They used a sliding mode DC-TENG and rotary mode DC-TENG to demonstrate the mechanism, resulting in a charge density value much higher (430 µC m-2) than that of the conventional device. The crest factor of rotary TENG was close to one, indicating a constant current output. The novel DC-TENG is an effective strategy to harvest mechanical energy and power electronics or charge an energy storage unit directly without a rectifier. The paradigm-shift in converting mechanical energy to electricity can also promote the miniaturization of self-powered systems in wearable electronics and sensor networks in the IoTs. Liu et al. further envision the device as a prototype to harvest lightning energy in the future.